Happy Friday! I hope you've had a great week! Mine has been way too busy so I'm seriously looking forward to some fun and relaxation this weekend. Tonight, my husband and I are going to be kid free to go my church's worship team Christmas party and then a little date night afterwards. I'm definitely looking forward to some downtime! I earned it this week! Today, I'm rounding up my top picks for what I'm currently loving. Gimme all of the cozy pieces right now! Which of my picks is your favorite this week?! 1. 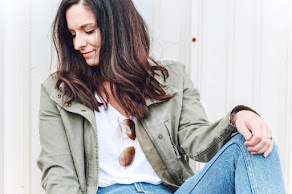 Sherpa Pullover | I am absolutely loving all things sherpa this season! It's so soft and so comfortable to wear! I made a special trip to try this pullover on in the store yesterday and I fell in love with it. I tried it on in small, medium, and large to find the perfect fit. I personally don't worry too much about the size label. The fit is all that matters to me, whether I end up purchasing an extra small or a large. I found the fit I was looking for in the size medium. I got this gorgeous mauve color in store but immediately ordered the off white when I got home. Such a great piece for the chilly weather! 2. Backpack | I am currently loving backpacks and I love the style of this one. Plus this pretty dusty rose color is one of my current favorites! 3. Long Sweatshirt | Who doesn't love a sweatshirt that is long enough to wear with leggings?! Sweatshirts and leggings were just made for each other! This sweatshirt comes in tons of colors and it's leggings friendly! 4. Necklace | I love all things Kendra Scott and I am loving the style of this necklace. I mostly only wear simple, dainty necklaces so this one matches my style so perfectly. 5. Distressed Denim | I recently purchased (and returned) a much more expensive pair of jeans that were so similar to these. I tried these on in my most recent Old Navy Try Ons a couple of weeks ago and I wish I would have purchased them then! They fit true to size and are so comfortable. 6. Peplum Top | This top was in this week's Target Try Ons post and it's so pretty! I love the peplum hemline and the henley style. Size up one size for the perfect fit. 7. Nike Sneakers | How cute are these sneakers?! I love the mix of gray and rose gold (two of my very color colors). I'm planning to purchase these shoes to take on my trip to Disney World (see what else I'm packing here)! 8. Cardigan | I also tried this cardigan on in my most recent Target Try Ons and it's worth mentioning again! The fabric is so incredibly soft and I love this winter white color this season. Such a great cardigan to cozy up in! Plus it's super budget friendly!